It's hard to get comfortable with the fact that the corrupt, totalitarian future George Owell predicted in his 1949 dystopian novel, 1984, is eerily aligned with the society we're living in today, at the hands of a white guy whose last name begins with "T" and rhymes with Dump. So it's fitting that the Michael Radford-directed movie adaptation, originally released in theaters just a year after its fateful title, will return to 180 theaters (and counting) in the U.S., Canada and Europe on April 4. At the beginning and end of each screening of the film will be an exclusive introduction and post-screening discussion with Radford, who will recall stories about the making of the movie and the ways in which Orwell's prescient dystopian tale has retained its haunting and powerful currency across continents and generations. Starring the late John Hurt and Richard Burton (in his last on screen appearance), Michael Radford’s film about Orwell’s 1984 has never been more vital. It uniquely resonates today with the recent rebirth of authoritarian political systems across the globe. 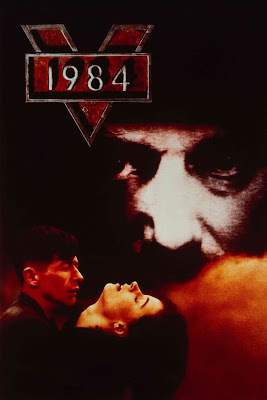 As foretold in “1984,” we find ourselves in a time where extremist political parties and unscrupulous national leaders have risen to power through the use of fear, intolerance, and contempt for truth. As Orwell portended and Radford superbly captured in film, “a lie becomes truth and then becomes a lie again." Well, I'm hyped. And I can't think of a better time to watch this film on the big screen.